W.G. Constable and J.G. Links, Canaletto, Oxford, 1976, p. 557, no. 704. W.G. Constable and J.G. Links, Canaletto, Oxford, 1989, no. 704. Geneva, Musée d'Art et d'Histoire, Art Vénitien en Suisse et au Liechtenstein, 1978. Brussels, Palais des Beaux-Arts, Dessins Vénitiens du XVIIIème siècle, 1983, no. 90. 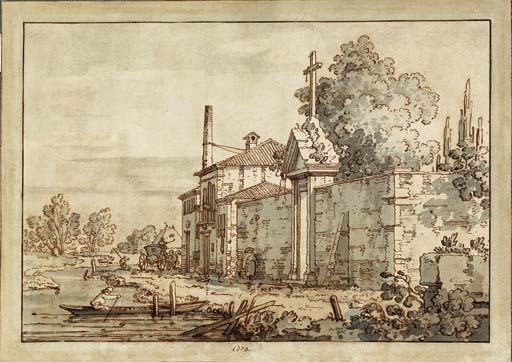 It is suggested in the Geneva catalogue that the drawing may date from the period of Canaletto's Paduan views around 1742. A. Corboz by contrast dates the drawing to 1755, in Art Vénitien en Suisse et au Liechtenstein, p. 182, under no. 162. Another version of the drawing is in the Boymans-van Beuningen Museum, Rotterdam, Constable and Links, op. cit.. The only difference in the composition of the present drawing is the absence of a carved shield in the entablature of the door and of one of the mooring posts. Another version with many more differences was sold at Sotheby's, 2 July 1958, lot 11.